Out and About: Muddy Sneakers is working with almost 3,000 students from 44 public schools in North and South Carolina, introducing many of them to the wonders of outdoor learning for the first time. For the Record: Muddy Sneakers participants keep a field journal to record their findings in national forests and state parks. Hands On - Muddy Sneakers encourages students to interact directly with the natural world, bringing new life to lessons taught in the classroom. Here, instructor Davis Hayden examines differences in the types of rocks found at Eagle Point Nature Preserve with students from Isenberg Elementary in Salisbury. Outsiders: During an Ecosystems Interactions study, a group from Augusta Circle Elementary in Greenville, South Carolina, led by instructor Carlisle Rankin, peers at birds at Bunched Arrowhead Preserve. When Muddy Sneakers’ fifth-grade students climb off the bus, they find themselves in a place that is exotic and sometimes a little spooky. For many Transylvania County kids, a science-based learning expedition into Pisgah Forest is a daring adventure. A typical day in the woods starts with the students breaking into groups of roughly 10. The instructor reviews wilderness safety and talks about the lessons and excitement that await. As the students hike, they scour the trail for specimens and explore creek banks. 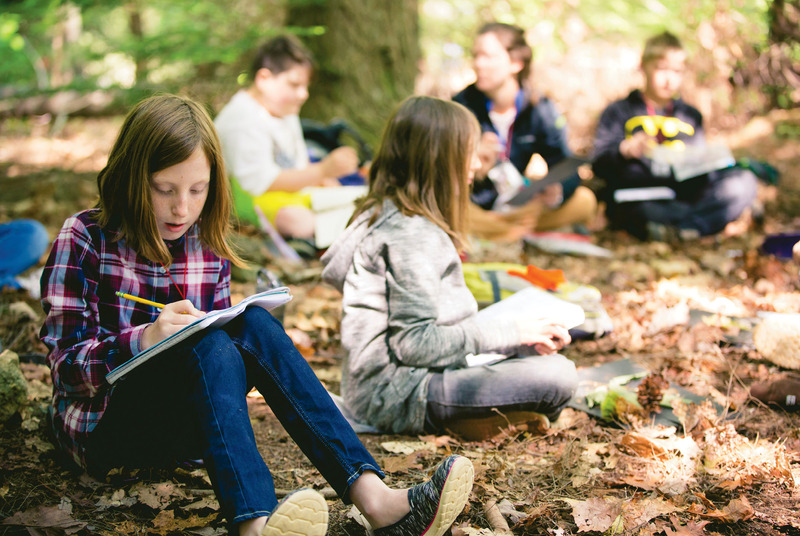 Eventually, the lessons commence and concepts like convection, ecosystems, velocity, and other standard fifth-grade curricula come to life in the wild. The kids also tackle experiential tasks like hanging bear bags, brewing tea from White Pine needles, investigating habitats, testing natural insulators, and racing handmade boats down streams. Later, the instructors allow students to sit and reflect, write creatively, or draw. There are also moments of spontaneity. Taking on the scientific process in wild places offers not only a boost of self-esteem but also improvements in standardized test results. According to Olson, every school that has partnered with Muddy Sneakers has seen its science test scores rise, and two schools had 100 percent of their fifth graders pass the state assessment. Encouraged by numerous positive trends, the organization decided to begin tracking its own data. Two years ago, Muddy Sneakers teamed up with North Carolina State University to implement yearly evaluations that it will use to measure environmental literacy. The organization is seeing a number of inspiring trends, including a sharp uptick in the self-efficacy of both female students and those with learning disabilities. While efficacy, knowledge, independence, and leadership are Muddy Sneakers’ benchmarks, a deep appreciation of place, be it wilderness areas or parks and backyards, is at the root of the organization’s ethos. Dedication to wild places is what first united Muddy Sneakers’ founders Sandy Schenck, Aleen Steinberg, and Chuck McGrady. The trio had joined forces in the mid-1990s to conserve DuPont State Recreational Forest, and in the summer of 2007, they met in Cedar Mountain, where they discussed the magic of childhood in the outdoors. The environmentalists envisioned a program that could work with WNC schools to inspire a love for Southern Appalachia, and the dream blossomed into Muddy Sneakers. Like-minded community members quickly joined the board, and John Huie, former director of the North Carolina Outward Bound School and Environmental Leadership Center at Warren Wilson College, became the organization’s first executive director. In 2008, in partnership with Brevard and Pisgah Forest elementaries, the team launched a pilot program that focused on learning trips to DuPont. Just three years later, Muddy Sneakers received a North Carolina Governor’s Award for Outstanding Conservation Organization. The organization has also started a pilot program in three counties in Upstate South Carolina. Approximately 3,000 students from 44 schools across two states are now muddying their sneakers. For Steinberg, reawakening children to awe and wonder is a mission of dire importance, in the Carolinas and beyond.